The United Presbyterian Church and First Presbyterian Church Women meet in the Fellowship Hall the 2nd Thursday of the month at 1:00 PM, September through May, for fellowship and Bible Study. The Mission Yearbook for Prayer & Study is used as an opening devotional. WE PARTICIPATE IN . . .
Fellowship of the Least Coin Offering, which is received at each meeting. We also contribute to the Salvation Army Christmas Food Drive, the summer camp scholarship program at Camp Pyoca, Church Women United certificates for disaster relief and our church's meals for shut-ins. We are active in Church Women United, observing the World Day of Prayer in March, Friendship Day in May, and World Community Day in November. We take part in presenting the programs and alternate with other area churches in providing host sites. We encourage and welcome all women of the church to join us in supporting the missions of the Presbyterian Church (USA). 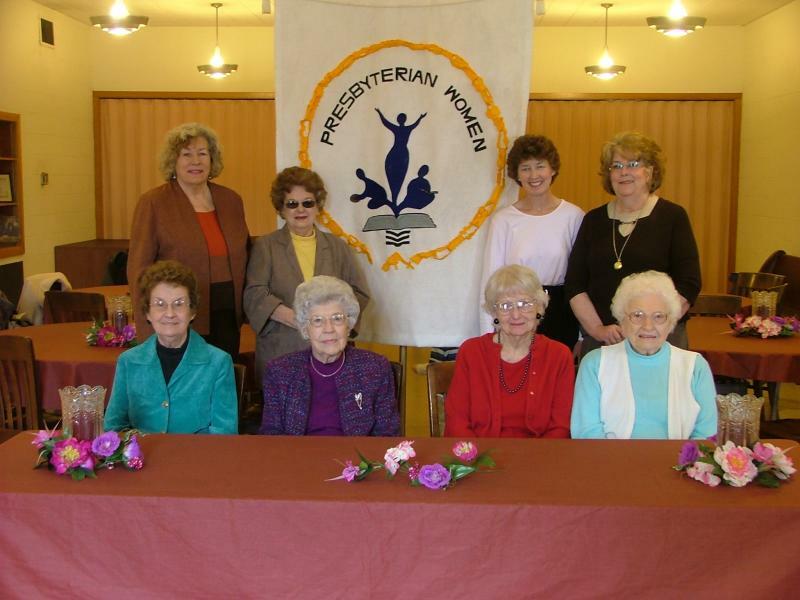 Back Row: (Left to Right): Ida Warren, Sandra Silkey, Margot Wynveen (Hnorary Member), Carol HynemanFront Row: (Left to Right): Mary Helen Wallis, Martha Helen Brokaw, Jean Shoulders, and Betty Dosch (deceased).Attendees not pictured: Jean Gilbert, Sally Hart, Alice Walters, Phyllis Woods, Barb Shannon, and Honorary Members: Martha Carithers and Francine Theriac.